Americas Cardroom has announced a new tournament schedule for 2015 which has been designed to cater for practically every type of tournament player. 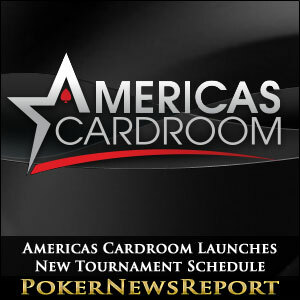 It is going to be a good year for tournament players at Americas Cardroom after the site launched an impressive schedule to welcome in 2015. A minimum of fifty tournaments are scheduled for each day – most of which have guaranteed prize pools – with a mixture of speeds and disciplines that will please even the most demanding player. 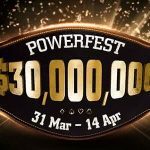 The site is also introducing a “Progressive Guaranteed Sunday Tournament” which is being launched with a guarantee of $25,000 and which will increase in value by $5,000 each week that the guarantee is hit. The buy-in for the progressive tournament is $215.00, and Americas Cardroom is supporting the event with a comprehensive satellite schedule. Among the tournaments in Americas Cardroom´s new schedule are some of the site´s most popular events – the daily “BIG10” events are still included, as is the Sunday $50,000 guaranteed feature. 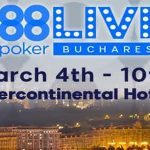 The schedule also includes a good range of Pot Limit Omaha and Omaha Hi/Lo tournaments, rebuy, megastack and “super-bounty” events, and a new “TURBO10” series of events which comprises of ten fast-paced tournaments each day. Whereas the “TURBO10” events will be more popular with players that have limited bankrolls (buy-ins range from $0.55 to $33.00), Americas Cardroom is also accommodating players that have more funds to play with. Each weekday there are eight tournaments scheduled with a buy-in of $50.00 or more (plus five on Saturdays and twelve on Sundays) including events with $10,000 and $15,000 guarantees. There is even a Wednesday tournament that has a guarantee of $25,000 for a buy-in of $109.00. The Beast rake race is having $20,000 added to each week´s prize pool throughout January (starts tomorrow until Friday January 30). Americas Cardroom is also adding $2,500 each week to its popular Sit & Crush promotion for players who prefer to play Sit n Go tournaments. TONIGHT Americas Cardroom is hosting two “mid-stakes” Cage events (NLHE and PLO) which will be followed by two nosebleed Cage events on January 14. Satellites are just about to start for Americas Cardroom´s $1 million guaranteed “Winning Millions” tournament that will be played on Sunday 22 February. If that is not enough to whet your appetite, Americas Cardroom also has the most generous rewards program available of any US-facing online poker site. Its Elite Benefits program has multiple reward levels and allocates player points using the “dealt rake” method – allowing tighter players to benefit from the betting actions of looser players. 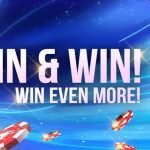 The site also offers frequent reload bonuses on top of its first deposit bonus of up to $1,000, a substantial number of freeroll tournaments and an “On Demand” freeroll leaderboard in which the winner each week receives $270.00 in tournament tickets to compete in real money events! Irrespective of whether you are a cash game grinder or a tournament guru, the next few months should provide plenty of opportunities for a lucrative poker experience at Americas Cardroom. Check out our review of Americas Cardroom for more information about the site and the Americas Cardroom bonus code you should use to take advantage of the generous $1,000 welcome bonus.